Indianapolis decks are a cherished part of a home. They make your backyard feel more like a home. It makes sense to properly clean and maintain them. We’ve found that power washing is the best way to do so. We’ve also found that many homeowners run into problems when they try to power wash their deck without being educated beforehand. These are a few tips on how to power clean decks and will give you all the information you need to know to properly clean your deck. Make no mistake about it: chemical deck brighteners will not actually clean your Indianapolis deck. They might make it look bright and shiny, but the real cleaning is left up to Power washing. When Power cleaning decks choosing a pressure washer is simple if you know what to look for. Pressure ratings are important. Pressure ratings should be determined by the type of wood your deck is made of. Softer woods call for pressure ratings around 500-600 psi. Harder woods call for ratings around 1,200 psi. When cleaning a wood deck, you should never use a pressure rating greater than 1,500 psi. 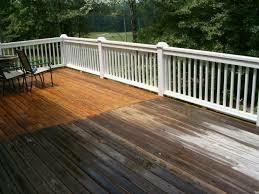 Doing so can ruin your deck and require a handyman service to clean up the mess. Expert exterior cleaning companies recommend a 40-60-degree fan or rotating tip. These types of tips allow you to tailor the pressure and speed to meet the surfaces you’re cleaning. They provide a huge advantage over set tips, which should never be used to clean wood. • Set the pressure to 600 psi and test it in a rarely seen area. This will give you a standard. Make note that you should always be working with the wood’s grain by spraying lengthwise. If you see that you are causing any damage, stop immediately and adjust your pressure. There’s no getting around the fact that pressure washing decks will cause some wood fibers to be raised. Even the best exterior cleaning companies admit to raising wood fibers on each and every job. The key is learning how to fix them. Spot sanding can be done on minimally damaged areas to smooth things out. For other areas, it’s recommended that the entire wood deck be sanded and then refinished. A 60-80 grit sandpaper should be used on the deck’s surface and a 100 grit sandpaper should be used on handrails if you have them. Don’t become a DIY horror story. Use this guide and its recommendations to have your deck looking clean without being damaged. Choose a proper pressure washer and tip, use proper technique, and fix raised wood fibers to make sure your deck looks as good as it ever did. Your family, friends, and guests will be thankful as they admire and enjoy time spent on your beautifully cleaned deck. If you decide that it is just too much work then call a professional power washing company and let the professionals do the job for you. If you walk onto a business property and the sidewalk is stained or covered with mildew or bubblegum, you tend to make an impression of that business. Well so do your customers. Your building, driveway and sidewalks may be the first impression that you have of a company so make a good one with a commercial concrete cleaning of your business premises. that all of your concrete surfaces have a professional appearance. Indianapolis Power Washing is a full service residential and commercial concrete cleaning company that is fully insured with general liability and Workman’s comp. Our choices of eco-friendly cleaning products also assure that your landscaping, your staff, and your customers will all be safe. Pressure can be defined as the force on a surface. In the case of pressure washing sidewalks, it’s the force of the water on the concrete. Pressure ratings are expressed in units of pounds per square inch (psi). Your pressure washer should have a minimum pressure rating of 3000 psi to effectively clean your sidewalk. There are a few situations where a higher pressure rating might be needed, but expert Indianapolis exterior cleaning companies all agree and recommend that 3000 psi is appropriate for residential use. When renting or purchasing a pressure washer, always make sure it has at least 3000 psi rating. Flow rate is defined as the quantity of liquid moving through a pipe or channel during a given period. Pressure washers use the unit gallons per minute (gpm). Flow rate is an often overlooked, but important part of pressure washing. If your pressure washer has a pressure rating of 10,000 psi while putting out 2 gpm, your sidewalk will definitely stay dirty. Indianapolis exterior cleaning companies recommend a flow rate of five to six gpm. This will ensure you’re using an appropriate cleaning speed to rid dirt and contaminants from the concrete surface. Some areas of your sidewalk may be more or less dirty than others. Cleaning speed should be increased or decreased to clean these different areas. By using a rotary nozzle, you give yourself the option to adjust speed to meet cleaning demands. A fan or circular jet pattern can be adjusted to allow the water to leave the nozzle at the speed you wish to use. It’s no secret that hot water cleans better than cold. Hot water pressure washers can be a bit more expensive than cold water ones because they have a heavy heating coil and burner system. While this might be concerning, you should take note that most experts agree that hot water is the way to go. In the end, it will save you time and money because the job will be done right the first time. The above mentioned four tips will help you when power washing your sidewalk. Use them to make your life easier and sidewalk cleaner. The overall appearance of your home or business will improve. If you can’t or don’t want to do it yourself, it’s recommended that you contact an experienced Indianapolis exterior cleaning company that can help you. You can also have your roof, the exterior of your home, or your decks powerwashed for a clean look around.